Michael McFadyen's Scuba Diving - Foggy Cave One of the few sections of the New South Wales coast that I have not dived in any great detail is the Central Coast area. Over the past 10 years I have often thought about diving the area from Broken Bay (the northern boundary of the Sydney Metropolitan Area) north. Despite this, the closest I have ever gotten was to dive Maitland Bay (home to the wreck of paddle steamer PS Maitland) where I did what was, perhaps, one of the most boring dives I have ever done. Until early October 1997 I had done no other dives on the Central Coast. This was a bit ironic, because as a child, I spent many a period leading up to Christmas on holidays in The Entrance/Shelley Beach area. While here I would spend most of my time in the water with my friends body surfing and snorkelling. However, while I remember visiting Norah Head, Bateau Bay, Avoca Beach and other "towns" here, I do not ever remember going to Terrigal. On 10 October 1997 I travelled to Gosford as a guest of the Terrigal Underwater Group (TUG). I had been invited by the outspoken former DIVE Log columnist, Christian Gerzner, a member of TUG, to give a presentation to the Club on the wrecks of Chuuk Lagoon. As a "reward", I was also invited to dive with TUG the next morning. After an exciting meeting (nothing like I can ever remember seeing before), I gave a short talk about Chuuk Lagoon, an overview of Operation Hailstorm and showed some slides of the wrecks. After spending the night at Christian's house at Terrigal, the next morning we drove the few kilometres to Terrigal Haven where the TUG boat is moored. 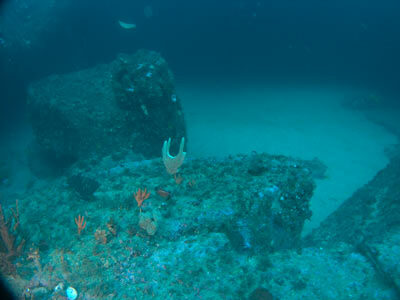 Our original plan was to dive the wreck of the SS Galava but unforeseen circumstances meant we had to change our plans. 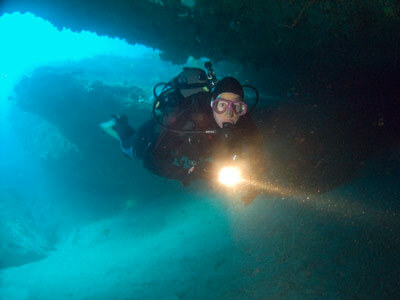 Christian decided that Foggy Cave was to be the alternative dive site. We loaded our gear aboard the dive boat (and watched Christian do a very shallow dive in his open dry suit while loading the boat) and were soon on our way to this well-known dive site. The weather conditions were very good but a slight north-easterly wind created a small annoying wind chop. 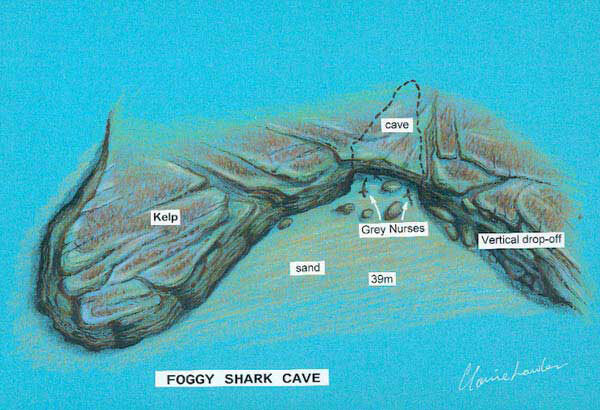 Located about three kilometres to the north of Terrigal and three kilometres to the east of Blue Lagoon, Foggy Cave is on the edge of a reef that is about 30 to 32 metres deep. There is a mooring at this dive location, paid for by TUG and Terrigal Diving Services. After tying to the mooring we drop to the bottom where the mooring is attached to a large boulder just off the main reef (not the mooring is now on top of the reef). 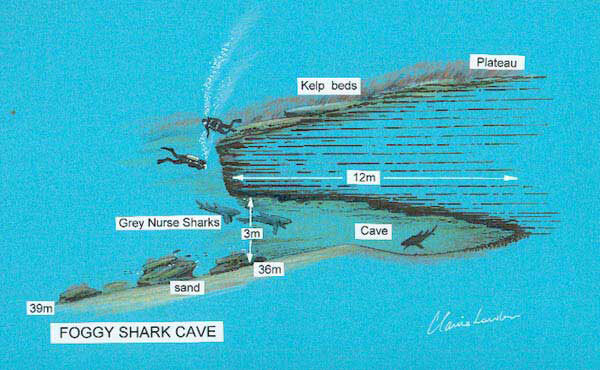 At the cave, the reef drops from about 32 metres to 36 metres at the edge and then goes in a straight drop to 39 metres. The floor here is a sandy bottom interspersed with large rocks and boulders. The wall is quite shear and in fact overhangs to form a wave-like structure. The main wall here runs south to north and then turns to run west to east. Foggy Cave itself is in the corner where the wall changes direction. The cave extends back about 15 metres or so and is quite wide (say 10 metres for most of its length). It is not very high, may be two metres, as there is a copious amount of sand on the floor. Christian told me that the cave used to be a lot deeper but over the years it has filled with sand. The bottom is not too silty but care still needs to be taken to avoid stirring up the finer material. There are some nice small gorgonias on the roof of the cave and just outside. After examining the cave, we followed the overhanging wall to the south. There are more gorgonias, some especially colourful (red, green, yellow, mauve etc) on the wall and ceiling. The sponge life along here is also excellent, very prolific and colourful. The reef runs for 30 metres before turning to the west. There are some larger "bommies" out off the main reef and these are also quite interesting. Along the edge there are many nooks and crannies, sometimes home to fish like eastern blue devils. There are luderick and red morwong on and above the rocks and many large black reef leatherjackets hugging the wall. The wall has a couple of small "inlets" before turning to the north. This is a sort of gutter that goes to a deadend. Just before it starts to turn back to the west and then south, there is a very small wall on top of the reef. We followed this wall across the top of the reef back to the east and soon come back to a spot above Foggy Cave. Note that the mooring is now located on a rock just at the point where the gutter and the small wall meet. Now you follow this wall to the north to the main wall and cave. We still have a few minutes to spare (this is, of course, a decompression dive) so we follow the wall to the east from the cave before returning to the mooring. We ascend after a great dive, extremely pleased with not only the weather conditions, but happy with the fish and marine life. The water conditions have also been favourable, with 15 metre visibility although the water was a bit cool at 15°C. All in all, an excellent introduction for me to reef diving on the Central Coast proper. Many thanks to the committee and membership of Terrigal Underwater Group for inviting me to address their meeting and to experience their local diving. A special thanks to Christian Gerzner for providing me with accommodation for the night and for arranging everything.